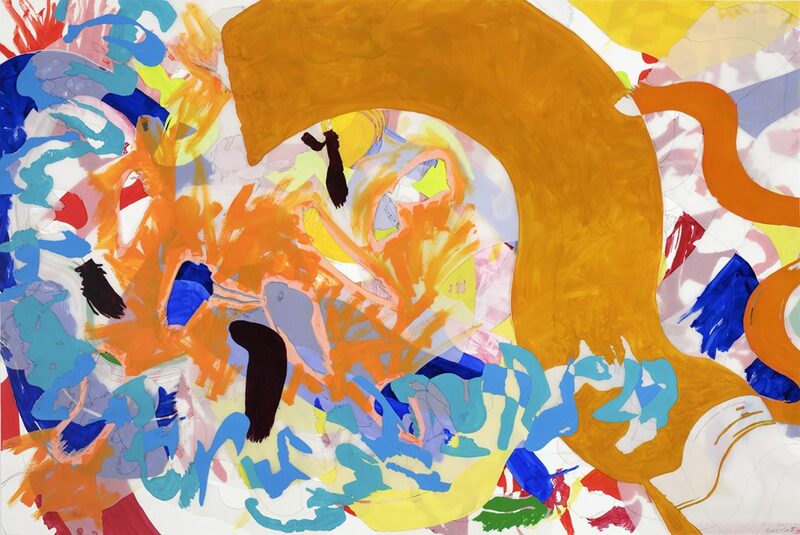 The jazz inspiration of Delaware-based artist Ellen Priest’s dynamic abstract series “On Being American / Jazz: Ryan Cohan’s The River” is on display from March 28 to June 6, 2019 at the galleries of “the first church of jazz,” Saint Peter’s Church (54th Street at Lexington in Midtown Manhattan). 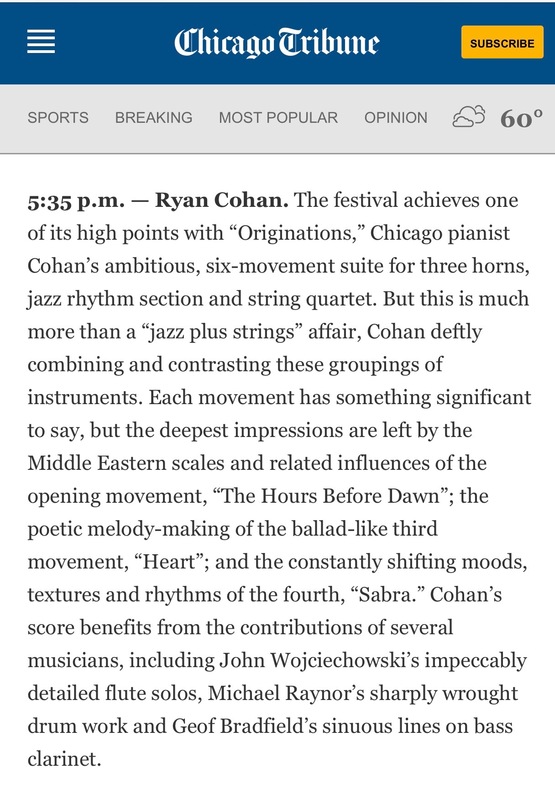 For her multi-year project, Priest reimagines Chicago-based pianist and composer Ryan Cohan’s celebrated The River suite as physical, visual art, full of color, open for viewers to see the music’s movement, space, rhythms, harmonies, and improvisation. “The River offers me rich musical spaces and emotional content to work with,” according to Priest, representing both a “coming home” and an engagement “with the contradictions in America, especially [its] persistent difficulty embracing the diversity that defines it and makes it thrive.” The exhibition will culminate in Priest and Cohan giving an artist and composer talk/mini-performance about the creation of The River art and jazz on Tuesday, May 7 at 6:30 p.m. at Saint Peter’s. Happy New Year! 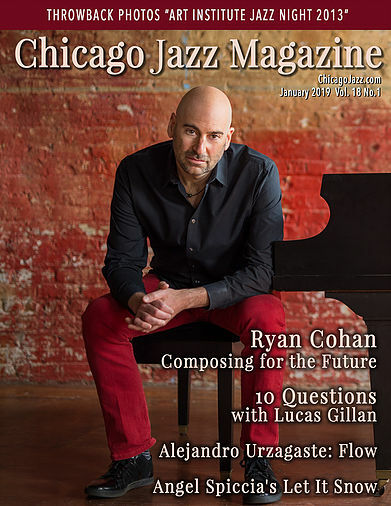 Very pleased to start 2019 with the release of this interview I did with Mike Jeffers for Chicago Jazz Magazine. We discuss my approach to composition, how I got started in my career, my upcoming new album and much more. Click on the above cover photo to watch the complete interview. New album ‘ORIGINATIONS’ in production! I’m very much looking forward to working with the Purdue University as their Artist-in-Residence for their 2018 jazz festival. Saturday, January 20 I will be performing with the Purdue Jazz Band as guest soloist along with Victor Goines and Dan Fornero and premiering a new big band arrangement of an original composition of mine commissioned by the university in celebration of their sesquicentennial. This week leading up to the festival, I will be coaching large and small ensembles at several high schools around Purdue in additional to leading a master-class on improvisation in the afternoon of the festival. For scheduling and other details on the Purdue Jazz Festival – Indiana’s largest jazz fest – click the above photo.